Both islands were expected to fall quickly by those invading them. Both proved vastly more difficult, and costly. In the early weeks of WWII in the Pacific, where one Allied disaster followed another, the surprising resistance at Wake Island felt something like a victory. When the word came out about the defenders sinking two destroyers and inflicting hundreds of casualties, it gave a nation that had psychologically (and strategically) abandoned the island inspiration. Although the famous "Send more Japs" message was really a false bit of radio code, it became part of the national landscape. The island did fall, but felt like a moral victory, like the "300 Spartans" of ancient times. 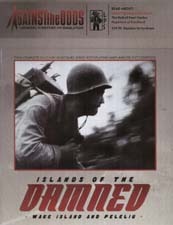 Islands of the Damned presents two separate solitaire games to explore these battles. Given Up for Dead covers Wake Island, while Utmost Savagery takes on the invasion of Peleliu. Designer Steven Cunliffe tackles both battles with innovative systems that force players to mix boldness with good tactics. You will be commanding the American forces in each game, challenged with doing far better than the historical outcomes. Can you save most of your troops from the Islands of the Damned?